Bushmans water pumps are manufactured by quality manufacturers using materials built to withstand Australia’s toughest conditions. They are approved to the AS/NZS4020 standard for drinking water. Many tanks need a pump and the selection of the right pump can make the use of your tank water far more effective. Our range of water pumps are used for many different applications. Our brands include Bianco Pumps, Universal pumps and DAB Pressure Systems, and we offer a full range of pumps for the house, farm, and commercial applications as well as fire-fighting pumps and accessories. Our pumps can be surface mounted or submersible which provides the flexibility needed for different applications. 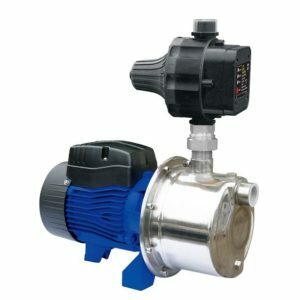 They also come in different materials such as stainless steel and plastic and the type of pump will be determined by the user’s needs. Our water pumps are used in a wide range of applications. Any situation that requires water to be moved and be used in another location or to be used with pressure requires a pump. The type of water tank pump that is best for you will vary on your needs. Applications include the use of water in the house, this can vary from the toilet and washing machine which are both a low flow simple pump to the shower and bathroom which requires a constant flow of water. Outside of the house, there is another set of requirements which could include watering systems through to washing down things which may make use of a pressure pump. Water pumps are generally a key part of any water tank system and matching the pump to the tank, and to the amount and pressure of water required is critical for a successful system. The key things to consider include; the volume of water required, the head that the pump must go up, the pressure required and the height of the water source above or below the pump. Matching the requirements with a water pump will ensure the system works as required. A submersible pump has a sealed motor that goes into the water and it is coupled to the water pump body and pushes water to the surface. i.e. It operates via its assembly that is wholly submerged in the water to be pumped. A surface mounted centrifugal pump uses a rotating impeller to increase pressure of a fluid. The surface mounted centrifugal pump sits above or outside the water source that is to be pumped. The submersible pump has both advantages and disadvantages and the pump selected will depend on the individual application. Which material is suitable for you? 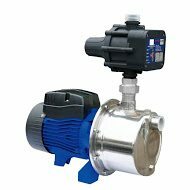 The material that the water pump is made from will depend on the different applications, but a stainless steel bodied pump is considered better quality that a plastic body. However stainless steel is significantly more expensive than plastic. Your choice comes down to what you need out of your electric water pump. Use of the pump, for example a household pump, will need to provide constant pressure and will need a volume flow that meets the needs of the household daily use. If a pump is just for the garden, then a simpler and cheap portable water pump will suffice. Centrifugal pumps that are used around a farm will have a wide range of different requirements related to size, volume, pressure, pipeline distance, height the water is to be pumped and the suction elevation. Whether you are looking for a submersible pump, electric water pump, irrigation pump, water transfer pump, sewage pump, well water pump, inline water pump, deep well pump or a water tank pump, Bushmans is the right choice. If you don’t see what you’re looking for here – please call us on 1800 287 462 to discuss your requirements.